The third largest but most developed of the seven islands in the Spanish-administered Canary archipelago, Gran Canaria has been billed as a 'miniature continent' because of the variety of climates and landscapes that it offers, from the big city bustle of the capital, Las Palmas, to the serenity of its lush woodlands. The Canary Islands lie in the Atlantic Ocean, about 125 miles (200km) from the African coast and almost 800 miles (1,280km) from the closest European port of Cadiz. Gran Canaria is almost circular, with a diameter of about 32 miles (50km), and is characterised by deep ravines that radiate out from the centre down to the coast. The north of the island is humid and lush, with green valleys and volcanic craters, while the south is arid and desert-like, with vast stretches of sandy beach. The interior of Gran Canaria has steep highlands dotted with small villages, sporting white houses with red roofs, banana plantations and orchards bursting with tropical fruits. Tourists generally favour the southern coastline, flocking to the well-known beaches of Playa del Inglés or Maspalomas, where the sea washes soft sands and empty dunes stretch for miles. 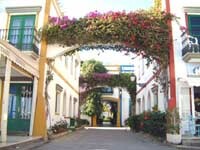 The capital, Las Palmas, lies on the northeast tip of the island, between two long beaches, Las Caletas and Alcaravaneras.